It’s been a bit since I’ve wrote much about the childcare kiddos. They are growing like weeds and my baby days are passing. The youngest here is now almost 15 months old. Ah…in a way it gets easier and in a way, it gets harder. Most days I have 7-8 kiddos that are between 28 and 15 months old. That is soon to change as yesterday was the last day of school. Now some of the school aged kids are having a nanny over the summer taking a little brother with them and other school kids will be here full time. It’s going to be interesting that’s for sure!! Before all that happens, I thought I’d show you some of the things we’ve been up to. We spend absolutely positively as much time outside as possible. Sometimes we play in the backyard…sometimes the front yard. The swing set is in the back yard and they really love it but we’re having trouble with the little ones. They haven’t figured out how to walk around the swing set without getting hit by someone who is swinging. 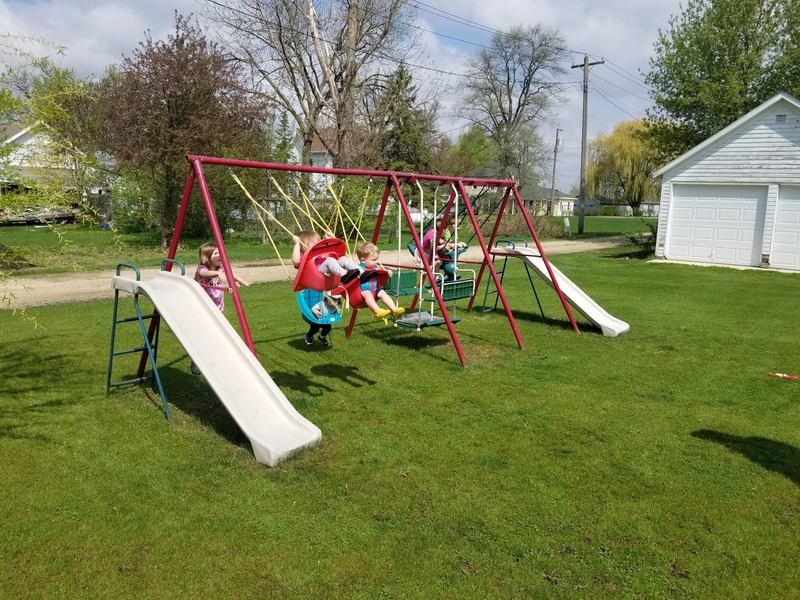 I am hoping we can get a sand box in place and then the some of the little ones will be playing there and it might be easier to keep track of the ones around the swing set. The swings and the kiddos both move so fast!! Here is one of my preschool kiddos. He saw my pincushion on the counter and immediately asked if he could “play” with it. I said, “Pincusions aren’t for playing with”. Then he said, “Remember how you let me organize it. Can I do that?” I had forgotten…I’ve not had a project around that needs pinning for a long time so no pincushions had been around. He has loved “organizing” the pins the pins in the past. I have some pins with different colored heads and some with butterfly heads. He groups them together. It’s a rule that the pincushion can only be “played with” at this counter so the little ones can’t get to it. He ended up having a helper. This is my new and improved designed pincushion. (Who needs toys I guess!!) A blog reader gave the pincushion to me a long time ago…I still use and love it! Here is Carver working on his Mother’s Day project for Kalissa. I took a paint canvas and taped a construction paper heart to it. Then I gave the kids paint and had them stamp their finger prints all over the canvas. I am working with little-little ones so what was to be fingerprints turned into smears. I took the heart off after they were done painting and left to dry. After they dried, we cut out a printed fingerprint verse and glued it to the project. Here’s how they turned out….Parents seemed to like them. Just before Mother’s Day a blog reader had sent lots of smiley stickers. Sandra in Oelwein did too. I ended up printing a page that said “Mommy makes me Smile!”. They they colored it and put smiley stickers all over it. Here’s one of little guys working on his. There is a HUGE childcare debate suggesting that childcare providers eliminate crayons and stickers saying it’s not art. They want us only to be doing “process art” and not “product art”. Process art is very open ended. It’s more like what my school aged kiddos do. I have a junk drawer and art supplies and they make whatever they want. The focus of it the creation. Product Art is different. It focuses the end product. All of the projects for the most part, end up looking exactly the same. I stay WAY away from any of those arguments. I think it’s important to have a objective to whatever activity you are doing with the children. For me, this little project that we did have NOTHING AT ALL TO DO WITH ART. It has everything to do with fine motor activity. All of my kiddos need to work to strengthen their little hands to hold a pencil or fork or scissor…The need strong hands and fingers that can move and work. Picking those little stickers off and putting them on a paper provides all sorts of fine work that they need. For the younger kids, working with stickers is hard. I’ve learned to cut the stickers in strips and then fold back the paper, the kiddos who are just learning can more easily grab a sticker then. I so thanks everyone who has been sending stickers to the kiddos. This is one of the many activities we do with the stickers. …back to the Process vs Product art debate. What I am doing with the kids is mainly filling their day with fun, letting them experience creating, and a great big chunk of it is simply learning the social norms of doing a project and listening to the instructions. I do know the kiddos LOVE anything art related. 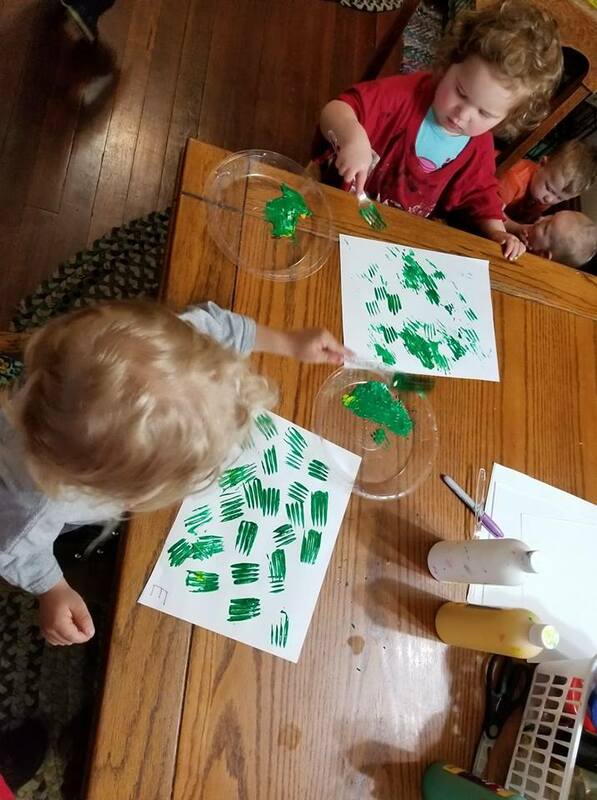 Here they are stamping green paint onto a paper to create grass. After these dried we added foam flower and rabbit stickers to make a picture. Nothing here is stressful for me or the kids. If the kids don’t feel like making something…they don’t but most of time they do. In fact, if I start digging in the art closet they squeal and run for the table. It’s incredibly cute. Now that summer is here we’ll be doing more outside time and less of these “art-like” projects. I am happy to report that we officially have two more potty trained. I have gone from 7 in diapers to only 5. What an accomplishment for us all. I have another one that has shown interest so I think I’m going to start in on the next two. Now if I can get my little boys to grow some patience and lose a little bit of their tempers, I’ll be in good shape. Can you believe that there are 4 of them are all between 15 and 20 months? Ready or not, summer vacation is here!! Wish me luck!! This entry was posted in childcare on May 26, 2018 by Jo. What do “those experts” know about child care. I think as long as the kids are well fed and are happy doing their “projects” who cares what kind of art it is. My little granddaughter ( same age as Carver) loves painting outside with a bucket of water and a big paintbrush. Paths, fences, walls all get painted. I loved crayons growing up and occasionally we got stickers! Keep doing what you’re doing Jo!!! I think a mom and someone who spends loads of time with children knows more than some so called expert! I would have framed my Mother’s Day heart painting had I gotten one!!!! I taught preschool for 25 years. I’ve discovered that, although process is important, product is as well. The littles want what they make to look like something. Even though I always taught my student’s parents to say, “Tell me about your artwork,” they inevitably would say, “What is it?”. Sigh…. I agree with Sharyn! Children like their work to look like ” something”! So much depends on how much direction and not having all activities being highly directed. Not all activeies need to be fully creative. It’s very appropriate to make gifts for others the children are proud to give. Regarding your sandbox project, I put some sand into a wagon for my great-grandchildren. Since they are not at my house regularly, I can pull the wagon back into the garage and it doesn’t get wet or dirty nor take up yard space. They love it. Ages 2 to 8 now and they love it. I love these posts about the kids. In California licensing only allows 4 kids under the age of 2 and so that was my limit back in the day. I really have to hand it to you, I thought I was a diaper changing wizard with 4. You’ve had 7? Mama Mia, that’s a lot! You’re activities look amazing and I’m sure its a wonderful change of scenery for you as well as the kids, now that the weather is letting them play outside. You have a teacher’s heart Jo. As I’ve said before, those parents are lucky to have you! Enjoy your weekend! Good Luck! They are so blessed to have you. Why does everything have to be about teaching the kids something? Their childhood is so short, they need to enjoy all facets of life and exploration. Almost any activity is working on their gross or fine motor skills and they all need that! Have fun with all your kiddos this summer. As a product of the 70s, I can guarantee you that no one worried about process vs. product and my development. In all of society, I think our biggest problem is that we think we have to label everything and everyone. Kids need time to just be-with dirt and crayons and blank paper and cardboard boxes and egg cartons and SOMEONE who loves them. I wish I could remember who it was on an Oprah show that said what every child NEEDS is for 1 adult in their life whose eyes light up when they step into a room. My grandma did that for me, as did some aunts and teachers and I am trying to do the same for my own children, the neighborhood children, my students, my nieces and nephews. I get that we need to have standards of care and teaching, but I do not believe we can regulate and govern everything. Good for you for providing a wide variety of activity, but most importantly an example of LOVE.